This small crag is at the north-eastern end of Pukekaikiore. 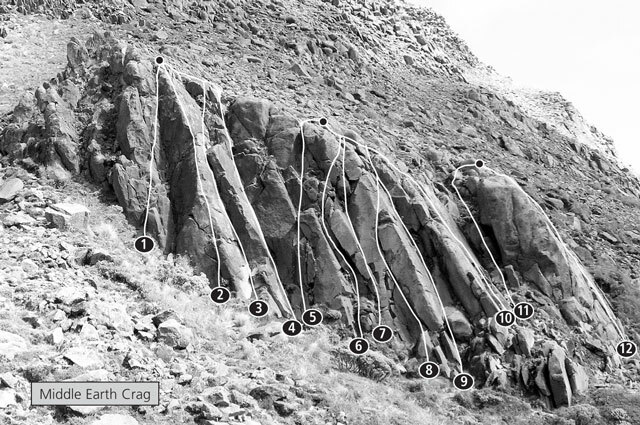 The many short routes here are ideal for people learning to lead and place protection; the crag was developed expressly for this purpose by Jo Straker and others at OPC during 1980–81. There are several fixed anchors at the top for belays, as natural belays are difficult to find. Be wary of the loose rocks that litter the slope above the crag. Walk off either side to descend. Climbs are described from left to right. The crag is at the north-eastern end of Pukekaikiore, 100 metres beyond the end of the poled track to the 1954 lava flow and 50 metres up the slope. Climb easily up to the ledge and then up the wide crack on the left, to a spike on the face a little above half height. Stand on this and step right to climb to the top. Top-roped only. The lack of runners would make this a bold lead. Climb straight up the flattish arête, marked by an obvious patch of orange lichen. Layback or bridge the bottom corner, then jam and bridge through the bulge to easier ground above. The second layback crack has a short, strenuous start before reaching easier blocky ground. Climb the two converging cracks to a ledge, move up to another ledge, then tackle the final chimney/corner. This left-sloping chimney can lead to the finish of Shadowfax. Alternately, finish up the blocky face. Climb up to a finger crack, which is laybacked to a ledge. Straight up to finish. Starts as a handcrack but blanks out at the top. Strenuous moves on large holds lead out of the crack onto the right arête. Finish up Frodo. Climbs cracks in the slab. The slab right of Frodo. Climb easily up the blocks in the obvious gully. Take care though: some of the blocks are loose. Climb the arête on the left of the slab (easier if you step right). There are three routes on this slab, graded 9–10.